Strawberry Creme Heart shaped peeps. Share your heart with someone special this year. The perfect Valentine candy. Marshmallow peeps in the shape of hearts. Each pack contains 9 strawberry creme heart shaped peeps. 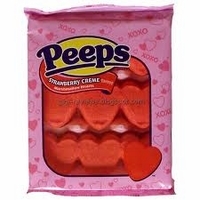 Everyone loves marshmallow peeps, these make the perfect valentine candy to give to the one you love. Each package has 9 marshmallow hearts.